Thank you for helping us with our branding and messaging efforts. If you have any issues with the logo, or require a different format, please let us know: 205-348-1582. The statewide logo should be used for events that are statewide or regional in nature; if the audience is primarily within a specific center’s territory, the Co-Branded logo should be used. Color- with Band. This is the preferred logo. It cannot be used on multi-colored or photographic backgrounds, and should not be stretched, compressed, tilted, or altered in any way. Reverse. Use the reverse logo when the background is not a solid, light color. Black/white. For use in black/white publications only. Accredited logo. If you need to use the “Accredited by America’s SBDC” seal, please contact Mike Brooks at 205-348-1582. The majority of our centers are located at four-year institutions, and it is important to recognize their contribution to Alabama’s small business community, and to the success of the Alabama SBDC Network. 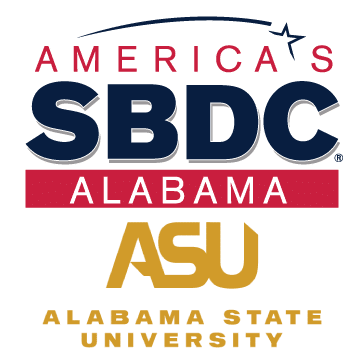 For local events, the preferred way to refer to the program is: Alabama SBDC at <host institution name>. For statewide or regional events, please use the Statewide logo (above), and refer to us the Alabama SBDC Network. Some co-branded logos are available in tall format (top/bottom) or wide format (side-by-side). If you need a specific format or resolution, please let us know. AITC, ASU (tall, wide), AU, JSU, Troy, UA, UAH (tall, wide), USA (tall, wide), UWA (tall, wide). Click to view the logo. Right click the link above (not the logo itself) and select Save As to download the logo. If you need two separate logos, please use the statewide logo (above), and contact the Center Director for their institution’s logo.